The very nature of a skewer—lean meat or fish interspersed with a variety of fresh vegetables and maybe brushed with a simple low-calorie, high-flavor sauce—all but guarantees healthy eating. Best of all, kebabs take just a few minutes to assemble and the potential for deliciousness is limited only by your imagination. Try one of our suggested kebab perfections (at left), or thread your own lean-and-mean masterpiece (at right). Now stop drooling and go fire up the grill! Step 1: Soak wooden skewers in water for at least 20 minutes before loading them up. The moisture will prevent the wood from catching fire and scorching your dinner. 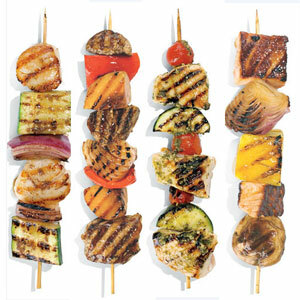 Step 2: The protein you’re cooking will determine the size of the produce on your skewers. Shrimp and scallops cook quickly, so fruits and veggies should be cut smaller. Chicken and pork take time to cook, so pair them with larger chunks. Step 3: You can marinate the loaded skewers in sauce before grilling—up to two hours for meat, but no more than 30 minutes for seafood. Or simply brush the sauce onto the food before grilling and at least once during cooking. Whether the food has been marinated or not, it’s always great to finish the kebabs with a light sheen of fresh sauce just before bringing them to the table. Step 4: You want a medium-hot grill—not so hot that it chars the food’s outside before cooking the inside, but hot enough that the food’s surface will fully caramelize.